Bowlers have enjoyed a decent outing all these years in the history of World Cup. Here is a list of the top 10 bowling figures in World Cups. Lasith Malinga’s second hat-trick in World Cup ensured a comfortable 9-wicket win for Sri Lanka over Kenya in World Cup 2011. That also was the first instance when a player took a hat-trick twice in World Cups. That put Sri Lanka on the top of the table. Kenya was looking for a big score when they were at 102-2. But once Muralidharan broke the 94 runs partnership between Obuya brothers, Malinga took the charge with a hat-trick and scalped 4 wickets in 5 balls. He missed out on repeating his own heroics of taking 4 wickets if 4 balls. Kenya was restricted to 142 and Dilshan and Tharanga ensured a comfortable victory for Sri Lanka. 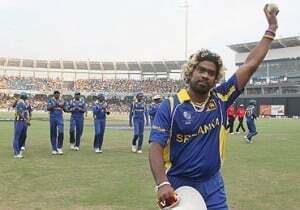 Malinga ended with 38-6. He stands at number 10 in the list of Top 10 bowling figures in World Cups.